Rome: Italy’s Interior Minister Matteo Salvini said he’ll allow 49 migrants on board a rescue vessel into the country on condition they will immediately be transferred to the Netherlands. “In Italy, we have already welcomed, and spent, too much [on migrants],” he said on Twitter. Sea-Watch lodged a complaint before the European Court of Human Rights. The Italian prime minister’s office said Monday it would argue before the court it is up to the Netherlands to deal with the NGO ship and its migrants. Salvini is “taking the people on board as political hostages”, said Sea-Watch spokesman Ruben Neugebauer. 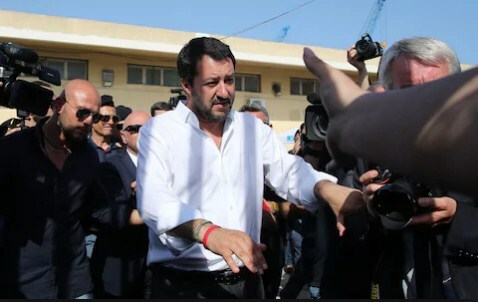 “They are trying to push it to the Netherlands,” he added, referring to Salvini’s insistence the Netherlands or Germany take responsibility for the migrants. Neugebauer stressed laws governing international waters are clear that ships in distress “must be brought to the nearest safe harbour”.